In the last few decades, a large number of workers have migrated toward the banana plantations. Even though the industry is corrupt and life is hard on a banana farm, many migrants feel any check is better than no check, and bananas pay, very little but something. But for many of these migrant workers, bananas ultimately cost a lot more than they pay. Bananas thrive in multi-crop situations, like on small family farms with other fruits and vegetables. But the banana super-powers – Dole, Chiquita, Del Monte, Fyffes, and Bonita – need mass production to be cost-effective, and so they clear out large areas of land and grow one crop. It shouldn’t be cost effective to grow on mass plantations like that, because it opens the bananas up to wide-scale pest infestations and disease. The companies spend a huge amount of money importing chemicals to the plantations, but the chemical companies help some, and so the costs must even out. In the meantime, thousands of workers and neighboring communities are exposed every day to the chemicals. First, there are the men and women who work with the bags – polyactic acid (PLA) plastic bags covered with various insecticides. 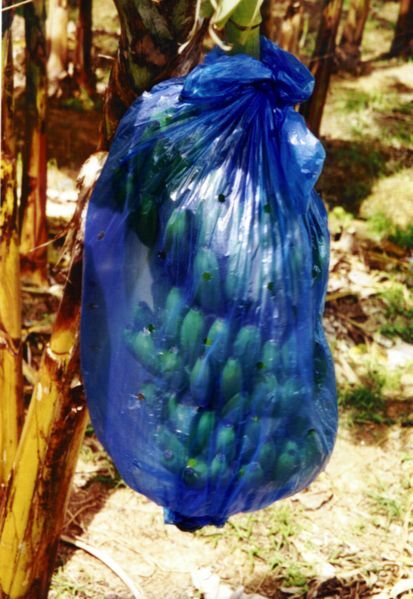 They place the bags over the bananas without any protective gear and are exposed to the chemicals at high levels. Next, there are the field workers. Because the fields are extremely muddy and damp, workers typically wear shorts. 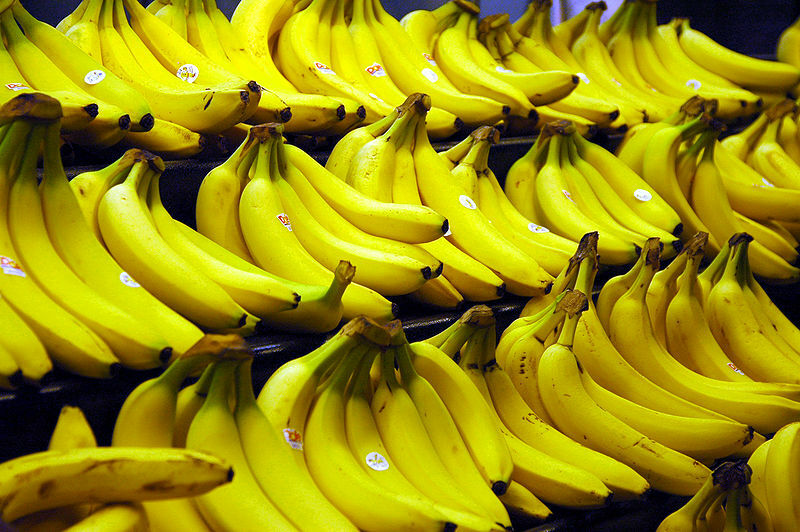 They spray the bananas with various agrochemicals, unprotected from the toxins. On some of the worst plantations, planes flying overhead spray the bananas at times when the workers have not been told yet to leave the fields. Cancer rain from on high. Lastly, there are the neighbors, whose water and soil receive the toxins from rain-washed bananas and whose communities are often accidentally sprayed by the agrochemical planes. The PLA bags can be found ingested in animals from mammals to fish miles away from the farms, so food security significantly decreases while the ecosystem is ravaged. Cervical cancer, leukemia, penile cancer, male sterilization, neurological damage, liver damage, kidney damage, lung damage, skin and lip malignancies, deformed and malformed bones (especially in young children), lymphoma, brain cancer, stomach cancer, prostate cancer, histiocytosis, Hodgkin’s disease, multiple myeloma, cancer of the pharynx, lung cancer. In particular, women are at a highly increased risk of cervical cancer and leukemia. Men are at a greater risk of developing penile cancer, melanoma and sterility. Both men and women are at a much greater risk of lung cancer. Next thing you know Dad is out of work because of a fatal disease, with no chance under his country’s laws to claim compensation from the American company he worked for. The kids are starting to cough, and one of them is not growing. There is no more edible food. The family becomes another group of little-talked-of banana refugees, moving elsewhere in search of a place to live, and in the father’s case, a place to die. Those migrant workers flooding the plantations come from places like Nicaragua to the farms of Ecuador in search of a better life. It is quite a gamble – one that many have lost. Airplane cropdusting a banana plantation in Nicaragua. Still from the documentary Bananas! One has to wonder what the families left devastated say to the young men they pass by on their way to seek food and medicine: Good luck? God be with you? Beware the highly toxic carcinogenic chemicals you’re about to be sprayed with? In unrelated news, Western doctors and advertising agencies are excited to report that, when eaten with a well-balanced diet, bananas can help prevent cancer. An example of one sterility case up against the major banana corporation Dole: Barren Justice.